In order to obtain accurate real time analytics integrate your marketing automation system with a CRM system. Act-On is the system that provides off-the-shelf module for integration with CRM system Sugar. The comprehensible Act-On installation provides duplex data synchronization of both Sugar and Act-on. This is a great advantage because you can choose which Sugar functionality you’d like to have in Act-On. Due to periodic synchronization data is always relevant. Here are the objects you can import into Act-On: Leads, Contacts, Reports and Campaigns. With such high-speed data analysis a sales rep can immediately adjust the e-mail or SMS notifications, both based on behavioral characteristics, as well as profile attributes. Such simultaneous use minimizes the risk to lose the opportunity. Sugar also enables the possibility to store data generated from Act-On Web forms. The data is not only accumulated in a marketing automation system, but is also automatically updated in Sugar in real time. 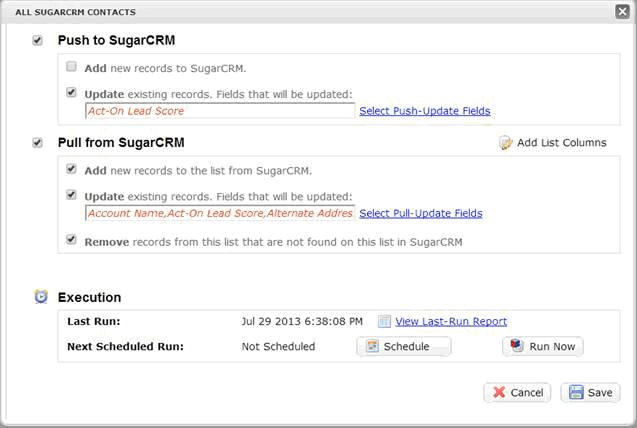 Want to integrate SugarCRM with Act-On?